These beautiful marbles are made from recycled glass. Our friends at Shasta Visions in beautiful Mt. Shasta made these for us. Here our original Coexist design has been melted into the glass, not just printed on top. All continents, major rivers and mountain ranges are highly detailed. 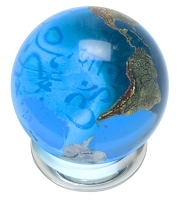 This Coexist marble works as a conversation starter, or a game piece. It's a perfect gift for the Earth and Peace lover in your life. The marble is available with a pouch and small stand, sold separately. 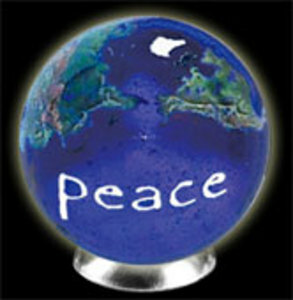 Peacemonger is the original designer of this popular image. We have a number of variations of "Coexist" in collection of designs. 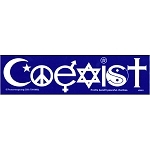 This version includes symbols for: Islam, Peace, Equality, Judaism, Humanism, Pagan, Wicca, Taoism, and Christianity. We have a sincere hope that these religions, be they based in mythology, reality, or reason, may find a way to communicate, cooperate, and coexist in peace. 'Coexist,' our one-word poem has made a place for itself in our culture as a modern day 'Peace Symbol.' 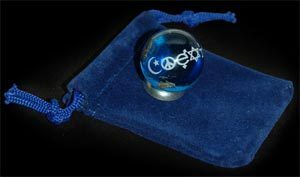 We appreciate having had the inspiration for the 'Coexist,' and our other popular Symbol-Glyph graphics and we enjoy producing them on items you will enjoy for a long time to come, in Peace. This Coexist Marble measures 1.25 inches.